I’ve got too many items! Recently I’ve been ‘modding’ Minecraft to be better and have more content. 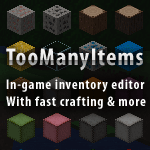 My first ‘mod’ was the ‘toomanyitems’ mod which is an ‘INVedit’ (inventory edit) and it’s really helpful for building something quickly. It can sort of defeat the purpose of the game for some people and instead of Minecraft it becomes Craft – you don’t have to work to get resources, you have all of the blocks and items in the game at the touch of a button. To get one diamond normally would take a good 20-25 mins of searching but with toomanyitems you can conger up a stack in a matter of seconds. You may think of it as cheating but that’s only if you constantly use it, lets say your mining, but your iron pick has run out and you come across a large diamond vein then you don’t want to go all the way back to make a pick, you want to mine it there and now! And you can with toomanyitems. It can be tricky to download with you having to download ‘winrar‘, toomanyitems and opening jars ect. but once you know what you’re doing it becomes second nature and it is one of the easier mods to install. If you want to download this mod for 1.8 watch this video.